Peterson Real Fyre Classic Series Gas Logs have withstood the test of time with traditional favorites, like the Post Oak, and by utilizing the most innovative technologies to help safeguard the environment. Gas fireplace logs are convenient and easy to use for most gas fireplaces. Their attention to log detail, log texture and flame presentation produce elegant displays that fill any room with comfort and beauty. This Peterson Real Fyre gas log set includes: Ceramic Refractory Vented Gas Logs, Vented Glowing Ember Burner, Custom Grate, Connector Kit, Glowing Embers, Sand, Burner Clips, and Damper Clamp. The Peterson Real Fyre vented G4 Burner with its single burner pipe allows the flames to dance through the center of your log set and has a BTU output of 50,000 BTUs. This propane set features a manual safety pilot. I admit, I am a detail person and was extremely nervous about purchasing logs online without viewing them in person. I have seen many log sets that not only look fake, but are just plain ugly! 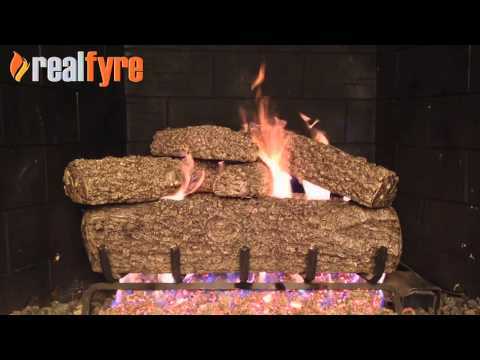 Peterson Real Fyre logs were recommended by our chimney sweep so I decided to take a chance. I am thrilled I did. These logs are beautifully crafted and reasonably priced. The logs look real, even the ends are fairly real looking. I added the decor kit with the pine cones to despise the ends a bit. We have received many compliments when they are not lit and more when a gas fire is burning! I never thought I'd enjoy a gas fireplace, I've always preferred wood burning, but this is so easy and beautiful without the mess of the ashes or having to make sure there is wood in the house. Customer service is knowledgeable, extremely helpful, not to mention patient! I had lots of questions.... I have recommend these logs and this site to friends, family and clients. Everyone that has followed my advice has been extremely happy! Set looks great. Fast shipping and great support. Thanks!! The selection was easy, ordering eas easy; was delivered in 3 days (during holiday season!!!). Installation was easy. Great price. Setup was easy, the flame is abundant, and the ceramic logs are about as realistic as I've seen. I was really impressed and glad I spent the extra money. One can get a gas log for around [$] at [...] etc., but the quality and realistic look just isn't there. Very nice product at a reasonable price. Very realistic looking Gas Log Set!!! Very friendly staff selling these items, helped alot. It is very realistic looking and warms the area around it well. And NO messy ashes to dump!!! The Peterson Real Fyre Classic Series Post Oak Outdoor Gas Log Set! Much attention to detail is taken when hand-painting each log. The ends and split sides of the logs are painted differently than the bark and red feathering really gives this log set an authentic look. See the Post Oak Gas Log Set in action. I live in Glendora California. My fireplace box has a capped off gas stub out (I believe it is 3/4). It has the key type shutoff on the wall by the fireplace. Do I have to add a separate shutoff in the fireplace before having a gas light set installed? Does your gas log set include a shutoff valve? Hi Mark! As long as the key valve is close to fireplace, so that you can reach both the valve and the fireplace at the same time, a separate shutoff valve in the fireplace is not required. The gas log set itself does not include a shutoff valve.